Dhaka Rosarium is an authentic flower shop with generations of floral expertise. 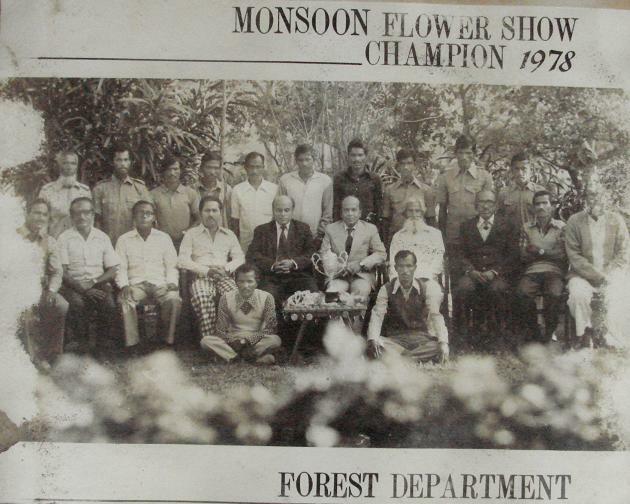 It started its journey in 1986 with a vision to commercialise flower as a product to be used in decorating interiors in Bangladesh.The guidance and supervision of the former Director of National Botanical Garden of Bangladesh, Mr. M.A. Hannan, has transformed both the enterprise and the industry since then.Until very recently floral business was never treated as a potential agro-based industry but now the flower industry has taken a firm shape in Bangladesh that generates a huge amount of revenue each year. What once was a vision has turned into reality. Dhaka Rosarium, the pioneer of this industry, has always been maintaining its excellence by ensuring high quality products, aesthetic decorations and reliable service. From the beginning of its journey, Dhaka Rosarium has been cultivating local flowers in its own gardens. In the early nineties, it also started to import flowers from different countries to meet local demands for varieties of flowers such as Gladiolus, Carnation and Gerbera. Dhaka Rosarium was also one of the pioneers in exporting flowers from Bangladesh during the late nineties. Dhaka Rosarium is now a trusted name in the world of floral decoration. Its showroom is situated at a convenient location at Hannan Plaza in Uttara, Dhaka with a friendly team to provide you with highest quality of service in a professional manner. Members of staff of the Dhaka Rosarium believe in service and quality, and whether it’s St. Valentine’s Day, Mother’s Day or any other special day Dhaka Rosarium can be relied upon, to provide you with the highest quality of service and customer care. Dhaka Rosarium offers a large variety of natural, artificial and dried flowers. Our collection of artificial flowers is so lifelike that one would easily think they are. We also sell a wide range birthday materials like candles, snow spray, party popper, balloons, gas balloons, pompoms of various kinds and colours, colourful birthday glasses and plates, ribbons, goody bags, birthday boards, cartoons and cards, all that is needed to make your special occasion even more so. The business offers a full service for a wide range of social functions. Whether you want your home to look perfect for a special occasion or you need the wedding hall to look magnificent for that special day, Dhaka Rosarium will take care of it all. Dhaka Rosarium also has a selection of stunningly different wedding souvenirs along with wreaths, bouquets and other floral tributes. We have been providing flowers to a wide selection of corporate clients for many years: sometimes a floral gift for a loyal or hardworking team member; often, a stylish floral design to enhance an entrance or reception area. In all cases flowers will help to create and project a good corporate image to your clients and members of staff. You are invited to visit us at our Sales and Display Centre located on the ground floor of Hannan Plaza (Opposite to Mascot Plaza), Plot 2, Road 1/A, Sector 9, Uttara, Dhaka. We are open from 8:00 AM to 8:00 PM, 365 days a year with extended hours from 8:00 AM to 10:00 PM on special occasions. Alternatively you could email us at info@dhakarosarium.com or call us on +88 017 111 80 700, +88 00197 FLOWERS(3569377), +88 01842 3569 37(Show Room).